Abstract sculpture fabricated from hot-rolled, cold-rolled, and stainless steel using rudimentary equipment and fundamental techniques, such as hand-bending, forging, and form alteration with heavy striking tools. Jarred believes that steel is figuratively, and literally, the backbone of the American culture. Without steel, there is no art. 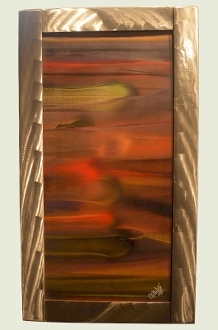 Evening Heat measures 26" x 15". Sculpture will be shipped by freight carrier at a charge to be determined by location. You may order the piece now and we will contact you with freight charges to be applied. You may call the Gallery direct at 305-294-8444 or email sales@7artistskw.com for assistance.